Home / Beauty / Deals / discount / Fashion / sale / shoes / Sperry / Set Sail on New Adventures This New Year with Sperry’s End-of-Season Sale! 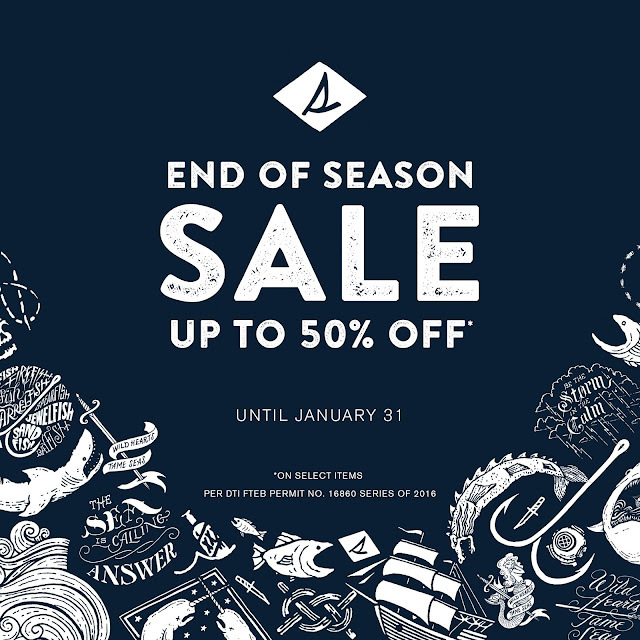 Set Sail on New Adventures This New Year with Sperry’s End-of-Season Sale! The New Year marks the start of new getaways in and out of the city, and now’s the perfect time to shop for new boat shoes, sneakers, and other essentials from Sperry's End-of-Season sale! Get up to 50% off on select items when you visit Sperry stores located at Bonifacio High Street, SM Aura, Glorietta 3, SM Mall of Asia, Robinsons Place Manila, Estancia Mall, UP Town Center, Trinoma, SM North Edsa The Block, Sperry SM Fairview, SM Southmall, SM Lipa, SM Baguio, Robinsons Place Ilocos, Ayala Center Cebu, SM Seaside Cebu, SM City Cebu, SM Iloilo, SM Bacolod, SM Lanang, Centrio Mall from January 1-31, 2017. Sperry® was founded in 1935 by avid sailor, inventor and intrepid explorer Paul Sperry. From the invention of the world’s first boat shoe to a full collection of sea-tested lifestyle products, Sperry offers the tools for life’s adventures.